Diagnosed with a debilitating condition when barely out of his teens, he was given just two years to live. But Stephen Hawking went to live on a further half-century. During those years, though confined to a wheel-chair and only able to communicate via a special voice synthesising apparatus, his prodigious mind roamed around the cosmos, attempting to solve its mysteries — from black holes to quantum gravity. How can we describe Stephen William Hawking? He was termed as the greatest scientist since Albert Einstein but declined to be so categorised — only accepting he was, at best, the greatest since the safe-cracking, bongo drum-playing, Nobel-winning Richard Feynman. It was only after meeting Feynman in 1979 that Hawking propounded his theory of the creation of the universe at — of all places — the Vatican. The 76-year-old Hawking has done the most in recent times to popularise science, not only by what he achieved despite his condition, but his sterling contribution across a wide swathe of astrophysics. He is the only scientist (or person for that matter) who appeared, as himself, on a range of TV shows spanning “The Simpsons”, “Futurama”, “The Big Bang Theory”, “Star Trek”, “Doctor Who” and even a “Monty Python” reunion. The physicist’s inspiring story gave birth to the 2014 movie “The Theory of Everything,” which was based on a memoir by Hawking’s first wife Wilde. Born in Oxford on January 8, 1942 to a pair of highly-intelligent but not very well-to-do parents, Hawking did not particularly distinguish himself in his early academic life, and it was only while an undergraduate at Oxford, did he begin to make his mark. Despite being diagnosed in his first year as a doctoral student with incurable motor neurone disease — the collective name for a group of five related degenerative neural disorders, like amyotrophic lateral sclerosis or Lou Gehrig’s disease in the US (after a prominent baseball player who suffered it) — that left him crippled and with a very short life expectancy, he did not despair. He went on to live a productive life, long enough to have to take mandatory retirement from his post at Cambridge University (the same position once held by Isaac Newton) because the University forbids anyone older than 67 from holding it. Referring to his position, he once quipped: “They say it’s Newton’s chair, but obviously it’s been changed.” At the age of 70, he participated in (and helped narrate) the Opening Ceremonies of the 2012 Paralympic Games in London. He also went on to marry and have children. Asked how he managed this, he is said to have cheekily replied that the disease only affected voluntary muscles. 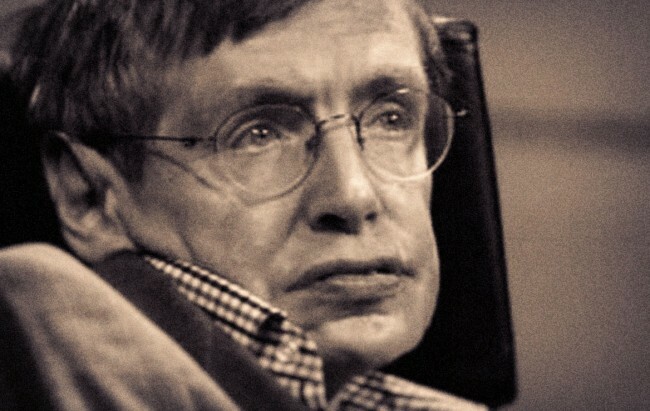 Hawking came to the notice of the wider public with his first book, “A Brief History of Time” (1988), in which he attempted to explain the structure, origin, development and eventual fate of the universe as well as a range of subjects in cosmology, including the Big Bang and black holes, to the non-specialist reader. Despite its promise of no equations, apart from Einstein’s e=mc2, it’s not a bedtime read. In its later editions, he also discussed time travel, ruling that it was impossible for various reasons, including the law of conservation of mass. Showing his sense of humor again, he once held a reception for any possible time travelers but only publicized it after it was already over. But it is black holes that Hawking was most concerned with. He did pioneering work in the field — though later admitting his theory of information loss in them was a “blunder” but his postulate that they emit radiation being held correct by data. The first to set out a theory of cosmology explained by a union of the general theory of relativity and quantum mechanics, and an enthusiastic supporter of the latter’s many-worlds interpretation, he was also one of the scientists who did not rule out the existence of a creator, expressing his realisation the idea of a God was not incompatible with scientific theory. In short, Hawking’s life was an exceptional and inspirational one. “Life has thrown at me both good times and bad. Perhaps it is human nature that we adapt and survive. As for me, I have lived with the prospect of an early death most of my life. I am not afraid of dying, but I am in no hurry to die. I have so much I want to do and find out first,” he said when he turned 72. We are unlikely to see his like again soon.